Much more consideration needs to be given to human decision making and how perception affects decision making when we think about risk. Imaging you want to buy a CD, you don’t like iTunes much and prefer the sensation of pushing that CD in the slot. So you go to your only remaining CD store in town and you chose your latest interest and proceed to the checkout, the CD is $30. When you get to the counter the salesperson informs you that a 50% sale starts the next day. If you come back later you can save $15. Do you buy the CD or return the next day? You don’t buy the CD but proceed to the next store to buy a laptop, you have your mind set on one you have seen in the catalogue for $1999. Once again the salesperson tells you that a “mark down” is happening later that day and if you come back the next day you can have the same laptop for $1984. Do you buy it or come back the next day? Research by Kahneman, Slovic, Plous etc in the tradition of Prospect Theory show that when given the same saving in amount of money we don’t use the same rational sense. About 70% of people say they will put off buying the CD but will buy the laptop immediately despite the same opportunity for a $15 saving. Why is this so? We often make up our mind based on the percentage of the saving rather than the absolute amount saved. Research shows we use similar decisions about “value” just as much as “utility” in who we want to marry, buying a car, vote for or make a career choice. Much of human decision making is unconscious and non-rational. When thinking about utility people focus on net worth, when thinking about value people assess and trade off gains and losses. The decision a person makes is also affected by the way the choice is “framed”. Prospect Theory helps explain how people make decisions between alternatives in risk. Developed by Kahneman and Tversky in 1979 as an alternative to utility theory which proposes that people make decisions based on utility or utilitarian outcomes, the quest for happiness. Prospect Theory proposes that, the loss of a benefit is considered more disadvantageous than the gain of that benefit is considered advantageous. When considering the way people assess risk a number of biases (more than 250) and effects come in to play (often exacerbated by emotions and cumulative benefit). For example: it is fascinating on TV shows like Deal or no Deal how contestants will depart from probability and give excessive weight to a low-probability outcomes. 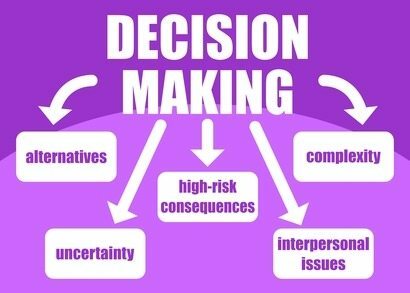 The reality is, we make decisions about risk based on much more than cognition, logic and rational mathematical thinking, many other aspects come into play. Understanding and managing risk is not simple but complex. Much more consideration needs to be given to human decision making and how perception affects decision making when we think about risk.